Make two observations about the picture. What does it show about slavery? What does this show you about slavery? ONE OF THE OBSERVATIONS THAT I SEE IN THE PICTURE IS THAT THEY HAD VERY POOR CLOTHES.ALSO THAT THEY WERE TO MANY KIDS WORKING IN THE FARMS.THEY ALSO LOOK LIKE THEY ARE OUT OF SHAPE. One thing that I see is kids and adults picking crops off the fields. Another thing that I see is that they are all African-American! In the picture I see Africans. Thay are in a plantation. They were going to pick up cotton. This picture shows me that there is no age to slavery. these are all African Americans on a plantation of cotton,look hot because they all have on sun hats.They look a little youg and there clothes are a littlen old!!! IT SHOWS THE SLAVES PICKING COTTEN ON A PLANTATION.IT ALSO SHOWS KIDS AEOUND 4 OR 5 WORKIND AND PIKING COTTN TO. ONE OF THE THINGS THAT I SEE IN THIS IS TAHT THEY HAVE POOR CLOTHES AND THEY ARE OUT OF SHAPE TO BE WORKING IN A FARM.ALSO THAT THEY WERE TO MANY LITTLE KIDS WORKING THERE. that boys and grils is picking fruits and i see slave house. The people working hard for nothing and the kids even had to work. There people in a plantation. They have them working. They are color people. It looks like a farm at the back. There are men, women and kids working. They had little kids workinf and they were too little to be working. They were picking up cotton. some observations i made where that they had slaves working on a plantation i also see that there clothes is kind of messed up. this tells me that they treated slaves really back then. There is a family that are slave. Also the family are in the cotton fields picking cotton. They were slaves. I see a boy pick up the leaf and walk back to they old house. And a grown men pick up the leaf to be help they mom and dad to come safe. THERE ARE PEOPLE PICKING COTTON AND THE KIDS ARE HOLDING THE BAGS WHILE THE ADULTS PUT THE COTTON IN IT. The picture show’s that there are slave’s picking cotton. Another thing that they show is that they would give the old clothes and you can see a house in the backround. they look tired and a hot day cleaning up the garden. The picture shows me that back then they didnt care about them didnt show them respect or nothing. It shows me african american kids in the field working. they didnt care if they were kids or not. UMM….THEY LOOK ALLL YOUNG AND THEY LOOK LIKE THEY ARE IN PAIN LIKE SOMETHING IS HURTING THEM….ARE SOMEONE WHICH THE WHITES ARE…..
* Slaves workedon plantations, all are Africans. *These slaves ages vary some are young others are older. It show that the black people is picking sulf from the garden and they look tired and sweaty. This show that slaves were getting treated very badly because they had dirty clothing and they had to work in the hot sun.They had worked on a cotton field. I see Africans wearing unconfterable clothes . They are in a plantation. They are picking up cotton. This picture shows me that there is no age to slavery because they are even kids in that picture picking up cotton. -it looks like they are all little kids. IT LOOKS LIKE A FAMILY OF SLAVES, WORKING ON A PLANTATION. BY LOOKING AT THE WHITE BALLS, IT LOOKS LIKE A COTTON FIELD. IN THE BACK, IT LOOKS LIKE A LITTLE COTTAGE. In the picture I can see people of the same race and they don’t look very happy. They look kind of depressed and like they don’t look like they would like to be treated. I can see that it doesn’t matter what age they are they just put them to work. This shows me that slaves worked very hard for a living. They mostly picked cotton, they worked from dawn till dusk, through the hot summer days till the freezing temperatures of the winter. Slaves were very unlucky during those times but still they survived. The Slaves Werent All Old, The Slaves In the Picture Look Very Young. Their Clothing Is Very Layered Considering The Fact That The Weather Is Very Hot. One thing I see in the picture is young kids and adults on the plantation and they have poor clothes. Another thing I see is that they are picking cotton. The picture shows that the slaves were treated bad. Also the main thing they picked was cotton. 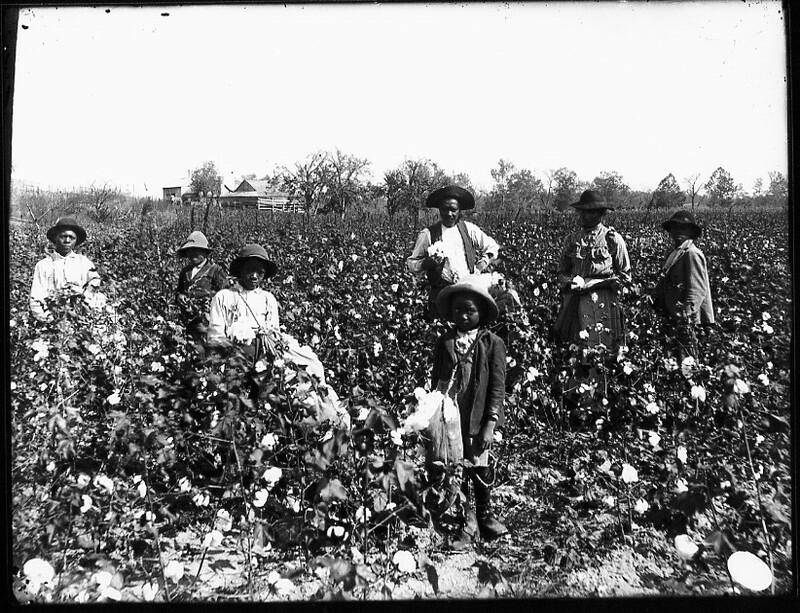 IN THE PICTURE THERE ARE SLAVES WORKING IN THE COTTON FIELDS!THEY LOOK KINDA YOUNG!THEY ALSO LOOK VERY SAD LIKE IF THEY DONT WANNA BE THERE!OF COURSE RITE!THERE IS ALOT OF COTTON!AND NOT MUCH PEOPLE!THEY LOOK LIKE IF THEIR HOT!AND TIRED! I see people working in the fields.kids adults working for food. they work hard for the wait people don’t separate whit the familiar and the kids is hard to work. I think they showing people picking cotton.It also shows that their is little people picking cotton. THE OBSVERATIONS THAT I MADE WAS SLAVES ARE PICKING COTTON FROM THE CROPS. AND ITS REALLY MESS UP BECAUSE IT NOT REALLY COOL ABOUT BEING SLAVES. There are some young and old people picking cotton. They are not dressed for the weather because there in brown and white. i see the african americans picking cotton.i see them in a plantation.there all african americans.this was there job. THE KIDS AND THEIR PARENTS PICKING UP COTTON. One of the observations I see is, kids between ages of 11-17 picking up cotton,Ialso see them all wearing hats. >THEY WERE YOUNG THEY WERE AT LEAST 10 TO 12 OR TO 20 SOMETHING. It shows kids and adults about 15-20 years old.It also shows that they are out of shape to be working on the field. IT LOOKS LIKE BLACK PEOPLE ARE PICKING COTTON FROM A PLANTATION.IT’S ONLY A LITTLE AMOUNT OF SLAVES DOING WORK.THEY ALSO LOOK TIRED AND THIRSTY.IT LOOKS LIKE THEIR ALL WORKING HARD. They were force to work hard and in the hot sun. It also looks like they force little kids were put to work too. This picture shows me that they didn’t care about who they put to work but just that they pick the crops for cash. i see kids picking cotton and i guess that they olders is too.. I THINK THE PEOPLE ARE WORKIN IN PLANTATIONS .THE ADULTS ARE PICKING COTTON. It’s about eight people in this picture.They look like they pickin cotton.It looks like they are wearing the same clothes.they also look old………. I SEE BLACK PEOPLE PICKING COTTON..
that their is little people picking cotton. in the picture shown above,it shows cotton pickers working on a plantation.from my point of view it shows as if they were a group of family bieng used as slaves.why?becuse if you look well at the picture it doesnt show them enjoying the work and they have little kids working on the plantation. it shows me that alot of people of younger age have to work picking cotton.. There are a group of slaves forced to pick cotton on the fields……they even make the little kids pick it. Looks like they are picking cotton.The kids and the adults and the white people did not care who did it they just want the job done. In the picure shown seems like there is 7 people in a cotton field picking out cotton.Most of them look like If they are pretty young not so old. one observation about this picture is that the african american looks like if they work hard and in a hot day. another observation about this pucture is that they have to wear poor clothes. WHAT I CAN SEE IN THE PICTURE IS SLAVES AND CROPS. I CAN SEE SLAVES WITH VERY POOR CLOTHES AND THEY LOOK VERY TIRED. I ALSO THEY WHAT APPEARS TO BE A COTTON CROPS AND IN THE BACK ROUND THERE IS ACRES OF MORE PLANTATIONS. The observation that i see is slavery African-Americans picking cotton with there children..It looks like they work on plantation and crops….. I think they are about 30-45 or older.But it looks like they they are pickin cotton.And they are wereing towrn clouths. Wat i see on the picture is boys and girls working as slaves…….. It shows slaves picking up cotton and they have old clothe on. ONE OBSERVATION I SEE IS THAT THEY ARE WORKING IN THE OT SUN ALSO THAT LITTLE KIDS ARE WORK WITH THE ADULTS. THE WHITE PEOPLE ARE MAKING THEM WORK ON PLANTATIONS….. There is nine people that look like slaves. Their clothes look messed up and durty.The background is just a small house and the rest is corn! THE PEOPLE ON THE PICTURE LOOKS LIKE THEY ARE PICKING COTTON.THEY LOOK LIKE VERY POOR YOUNG BOYS.AND,THEY ARE WORKING IN THE HOT SUN. Some people look very young. They look tired and the plants that they are standing next to look like cotton so they were probably in one of the ecomiendas. The clothing they have look very layered and with the hot sun i think they were probably sweating. There are SLAVES loockslike A family yung and old their in A cotton field PIKING COTTON. In this picture I see slaverys in the hot sun picking cotton and they are wear a black hats and black tshirst. They are working in the fields. There are children working in the fields aswell. IT SHOWS THAT THEY ARE PICKING COTTON. AND STANDING TO TAKE A PICTURE………..! THAT THEIRS KIDS.THEIR WORKING ON THE PLANTATIONS….,……,……,……,……,……..,…….,…..,…….,………….,. They look at the age of 14 or 15. What they were doing was picking cotton and had old, dirty clothes. WHAT I SEE IN THE PICTURE KIDS PICKING UP PROBALLY COTTIN OR SOMETHING ELSE. IT LOOKS THAT THEY ARE IN A FARM.THEY ALSO MAYBE SLAVES. -They had to work hard. what this pic showes me is that these people ar not happy.. they dnt like being bossed arond.. these peeps look yung and like around there mid 30’s 0r 40’s…its also looks and i think that they are working in a plantation.. THE AGE OF 30.MAYBE EVEN 20 OR 25.THE “WHITE MAN ”HAS LITTLE KIDS WORKING OUT THERE I REALLY FEEL BAD FOR THEM . It looks like there picking up cotton.It also looks like its in groups that there mamking them do that.There also making them do all there work. 1. they are picking up cotten. they did’nt have much and worked out in the hot sun. they were picking cotton,the little boy is 9 years. they are working in the field.ant he children look like they are 5/10 years old.i see slaver i the hot sun picking cotten. It looks like beings slaves was hard.they look tired. the close looks old. they picking up something. SOMETHiNG THAT i OBSERVED iN THE PiCTURE WAS THAT SMALL YOUNG KiDS WERE WORKiNG iN PLANTATiONS iNSTEAD OF THEM GOiNG TO SCHOOL!! I see people working on the fields picking up cotton and also kids…. are put to work under the hot sun without any protecion. they are wearing really old ragety clothes. what i also noticed is that there are whole familys working in the plantations. they are in the hot sun .